It’s a tough choice out of the original classic series of 184 titles authored by 30 different writers. The books were set in locations around the globe, in outer space, under the sea and in a number of distinctly imagined fantasy worlds. Choose Your Own Adventure features every known literary genre. I’m old school with my picks, which opens me up to legitimate critiques about unity, plot and otherwise, but I can’t help it, I like what I like. 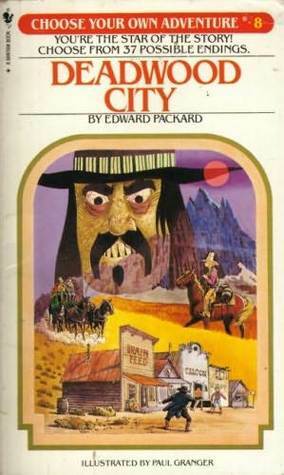 My favorite author of the series is easily Edward Packard. This was one of the better early entries in this series. Paul Granger’s illustrations were great. It’s spooky–a mysterious house, a surly, ugly groundskeeper, a creepy old woman in a rocking chair who pops up all over the place, an evil black cat, and other elements combine to make this a timeless CYOA horror-genre piece. You face off with Kurtis Malloy in a classic High Noon-style showdown. So what if little comes of it? The form was still learning whether (and if so, to what extent) a unifying plot thread could run through it. There’s plenty enough drama and adventure to make it fun and fairly compelling. You can join a high-stakes hand of poker in the saloon, which will either ruin you or win you a fortune. You can start a newspaper in Deadwood City and get involved in disputes between cattlemen and ranchers. You can ride shotgun for the stagecoach. You join a gang of desperadoes. Plus, this is an interesting case of the gender issue. Although the cover doesn’t hit it that hard, the interior illustrations Paul Granger clearly depict “you” as a young blonde. But Packard never deals with it. Could he have? Some say no, but I think he could have and may have even seen not doing so as a lost opportunity. The books never mention gender at all, and, except for the suggestive illustrations of “you,” they carefully avoid casting your character as male or female. Deadwood City is strangely interesting by being willing to play with the dynamic at all. Yes, street cred goes to it for being the first. But even with its overabundance of endings, you still have–and here’s what’s so important–adventures. It’s fun. You might say that the “time machine” method for choice-driven literature is about as good as it gets when the plot matters less and the sheer interest of the locales and adventures make for the fun. In that way, you could almost call this idea (or technique) like that of a picaresque. Through the “time machine” cave you go to the Titantic, the Great Wall of China, several medieval times, dinosaurs, the 1950s, to name but a few. The feeling of this book is different from most other books in the series, with mysterious and often sinister implications. Paul Granger’s illustrations again heighten the effect. 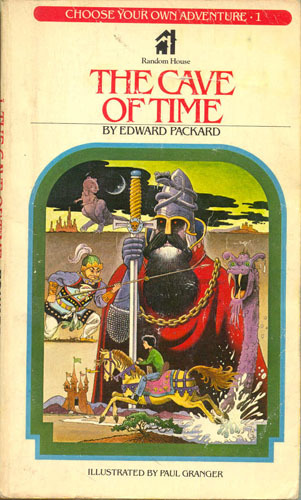 Who is the bearded character with the sword on the cover? 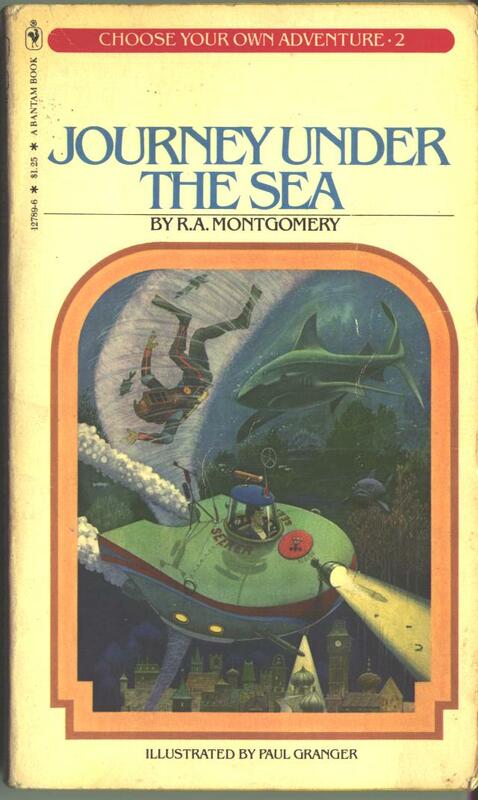 R.A. Montgomery deserves his due. He may have favored big ideas over unity, but his books have their own bizarre charm. This may his best first example of high imagination with a more cohesive plot structure. You and your best friend Carlos have traveled to Nepal in search of the fabled Yeti or abominable snowman. 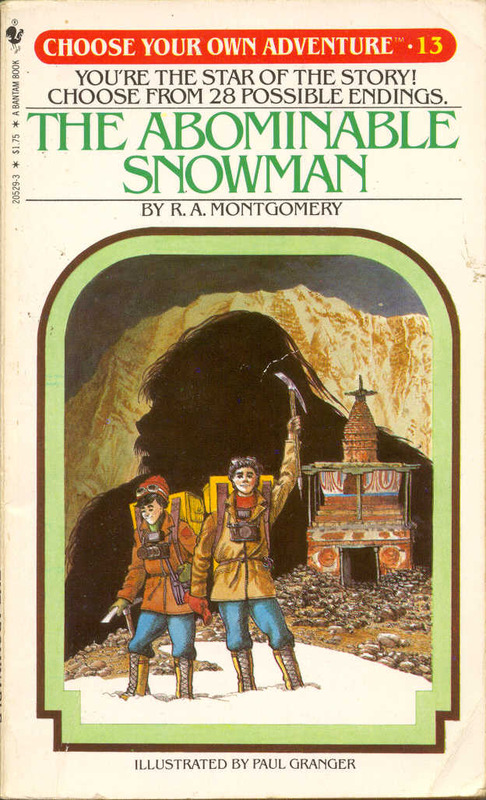 Last year while the two of you were mountain climbing in South America, a guide told you about the legendary creature and you haven’t stopped thinking about the Yeti since. Carlos arrived and went straight into the mountains when a Yeti sighting was reported. He hasn’t been heard from in three days. A late monsoon storm has moved in and the mountains are almost impassable. You know Carlos will depend on you to do the right thing. But what is it? R.A. Montgomery’s first book of the series was compelling and gave a nice dimension to just how many diverse places these books would go. Here you are a deep sea explorer on a mission to locate the lost city of Atlantis. According to legend, the city mysteriously disappeared many thousands of years ago. One day, as you are searching the ocean depths, you are trapped outside your underwater vessel. As your friends begin to haul you up, a giant squid heads directly toward you. Will you attack the squid with your spear gun, or will you signal your friends to pull you up at top speed?